Kathak was then introduced as a form of entertainment in the courts of the Hindu Rajas or Kings and became a secular art. It soon involved dance and song as these rhapsodists reached the point of ecstasy in their devotion. Then it became a fulfledged hereditary art. It was one of the ancient, great classical forms and was recognized in the Hindu Shastras, the artistic canons for these arts which were still religious. Kathak was then introduced as a form of entertainment in the courts of the Hindu Rajas or Kings and became a secular art. It is during this period that it began its development as a distinct and individualistic style, In a great period of renaissance in India, the cult of Krishna was at its height. The major part of the interpretive themes centered around Radha Krishna (symbolic of the urge of the soul for the universal of divine soul). And these themes were developed into passages of mimetic dance (or dance drama, as they soon became) retelling incidents in the life of Krishna. Simultaneously, material verses using, words in praise of Krishna coupled with rhythmic syllables came to be composed and used in Kathak Thus another dimension was added to this highly composite form. The curtain next rose on the Mughal period, which brought, with the invaders, a new culture from Persia and a new sort of court-life. 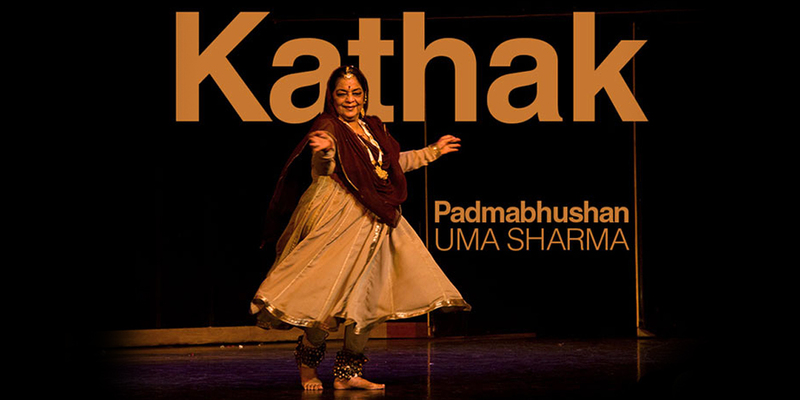 The Mughal Emperors appropriated Kathak dance and introduced it into their courts and the dancers they imported from Persia and elsewhere, were influenced by Kathak, and, in, turn, influenced it. Nawab Wajid Ali Shah of Lucknow who was not only a great patron but also a great poet and dancer himself, brought the great Kathak into the court as teachers or performers and another dimension was added. This period gave to Kathak a high degree of a formalization and stylization & also imparted it a vivid to sensuous quality. The technical vocabulary of the dance, too, found its fullest flowering exemplified by sudtler nuances of emotional values, a wider range of movement and more intricate footwork (the values now considered characteristic of Kathak). The Kathak dance from depicts ‘Life’. The three phases creation, preservation and destruction are clearly reflected through this media. It is therefore based on natural movements and is not confined to mudras. Its poses more life like than sculpturous and abhinaya subtle and true to life cover a very large convas.